Casa SiempreViva is located in Torrox Costa, a town of Malaga in the Costa del Sol, that is washed by the Mediterranean and is considered to have the best climate in Europe. It is located at the foot of the Sierra de Almijara and is characterised by the cultivation of tropical fruits such as custard apples, avocados, mangos and medlars. It is bordered by the towns of Nerja, Frigiliana and Cómpeta and by the Mediterranean Sea, that influences the climate and gives us mild temperatures during most of the year. Its excellent location and its connections with Malaga (the Capital city) and Granada allow easy access to the beaches located in the area and to the cultural activities organised in the centre of Malaga and Granada. You also have the opportunity to ski in winter. Even though Torrox is quite a touristic town, Casa SiempreViva is far enough away to offer you a quiet stay with spectacular sea views. 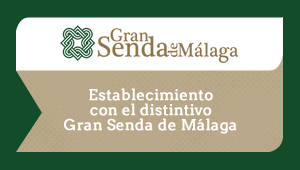 We are also included in the route of the Gran Senda of Malaga (GR249 - Stage 04: Torrox-Nerja) and we can stamp your passport as a hiker. Live idyllic moments and feel the soft sea breeze while cycling to Nerja and Torre del Mar. You will think you are in a film. Look at Malaga straight in its eyes from a different perspective. Book a quiet sunset boat tour, take a bottle of wine with you and toast to a unique holiday. Discover the inland region of Axarquia, by visiting Lis in her village. You can get to know its natural springs, the local flora and fauna, the traditional meals or her vegan and vegetarian proposals first hand. A 100% personalised experience. Discover the most interesting local wines straight from the winemakers’ hands. Learn the key aspects of the biodynamic viticulture, find the characteristic aromas of local grapes or enjoy delightful pairings based on local products. Bring out your most exploratory side and discover the caves with exclusive access from the sea. You have all the equipment you need to live an unforgettable experience at your disposal. Did you think that the Costa del Sol only offers crowded beaches? You were wrong! We want to share with you some of the calmer coves that offer sun beds and restaurants, so you can have a totally relaxed day. Discover the surroundings by moving your body while enjoying the energising views of the sea and the nearby towns of Torrox, Nerja or Frigiliana. Do you prefer to visit the surroundings on four wheels? Then the routes by car are the perfect option for you. Ask us, we will be happy to recommend the most beautiful and characteristic landscapes of the area. With a sandy area of 1,400 metres, Peñoncillo beach is one of the closest beaches to Casa SiempreViva (800 metres). Both waves and tourist presence are moderate. This makes it an ideal beach to spend a relaxing day in summer, take an inspiring morning walk on the dark sand or enjoy the colourful autumn sunsets while having a picnic with local products. Moreover, it is very close to the N-340 road, making it easy to access by car. It is attached to Mazagarrobo beach, thus becoming a very extensive beach. With a reduced number of tourists coming in, Mazagarrobo beach is one of the quietest beaches in the area. This makes it an ideal place to spend relaxing moments reading a good book or to simply enjoy a calm atmosphere. It is a narrow beach located next to the N-340 road, with low tourists’ influx and little equipment and services. It is attached to Peñoncillo beach, thus becoming a very extensive beach, ideal for a stroll. It is 1,200 metres long and moderate waves. With a short length of 150 metres, Wilches beach is a small and isolated beach located next to the N-340 road. It is ideal to spend relaxing moments, given that it is not usually very crowded. Its sand is dark and it offers a quiet environment, ideal for those who are seeking silence and calm. With little equipment, Calaceite beach offers dark sand and it is only 400 metres long. Its waves are moderate and it usually has few visitors. This beach is one of the most popular in the area. It is 1,200 metres long and can be accessed by disabled people. Its waves are moderate and it is usually quite crowded, especially during the summer months. With numerous services at your disposal, El Cenicero beach, in Torrox, has a medium occupation rate. It is 1,200 metres long, it has dark sand and its waves are moderate. This beach usually receives many visitors, especially in August. It is 1,200 metres long and it has dark sand. Its waves are moderate and it is accessible by disabled people.